Growing up I didn’t know from schmaltz. In fact, I didn’t know from anything remotely Jewish. The only Yiddish I’d committed to memory was from the libretto of Fiddler on the Roof. So you can imagine my confusion when, in 1987, I slipped into a booth at the Second Avenue Deli in New York City and was confronted with a glass condiment container full of something too yellow to be mayo and too light to be mustard. “What’s that?” I asked my friend Tom, who’s Italian through and through but, I think, dated a Jew or two along the way. “Schmaltz,” he replied, which left me no more informed than I’d been before asking. Instantly my gut buckled. At the time, I think my total daily fat intake hovered around five grams. This was, after all, the ’80s, and I was in my 20s. Tom explained that many old timers spread it on their bagels or bialys in the morning. I grabbed the jar and grimaced as I deposited it on the table next to ours. If I was going to pat down each individual slice of my hot pastrami sandwich with napkins to wick away excess fat (yes, dear readers, there was a time I actually did that), I was not about to stare at a jar of schmaltz while doing so. Today, though, I adore schmaltz. I think chicken fat slowly rendered with onions is one of the great elixirs of cooking—and life. If someone were to find a practical beauty application for it—say, wrinkle-free skin—I’m pretty sure I would bathe in it. I’m not alone in my adoration and deification of schmaltz. Best-selling author and cookbook-thumping cooking evangelist Michael Ruhlman, along with his photographer wife, Donna Turner Ruhlman, recently created a beautifully designed electronic book (don’t think “e-book,” as it’s sooooo much lovelier and more sophisticated than that) aptly titled The Book of Schmaltz: A Love Song to a Forgotten Fat. Just to state the obvious, anyone who sings a love song to fat has already wooed me. The table of contents—superimposed on a sensuous image of melted schmaltz being poured into a canning jar, its yellow color glowing like a Venetian sunrise—features eight simple-to-navigate sections, including recipes both traditional and contemporary, how to make schmaltz, and a chapter devoted to Lois Baron, a neighbor and friend of the Ruhlmans who inspired the book. The foundation of the book is, of course, Ruhlman’s schmaltz recipe, which is extraordinarily easy. Six steps, 90 minutes, and you’re in business. Classics such as chopped liver, kreplach, and potato kugel follow, as do unconventional dishes including vichyssoise with gribenes and chives-and-chicken confit. They’re now yours for the making. Not an iPad lover or an eGeek? Not to worry. The book will appear in traditional paper-and-ink form soon, as part of an upcoming six-book collection—which makes me wonder what overlooked ingredient Ruhlman will lift to rock-star status next. 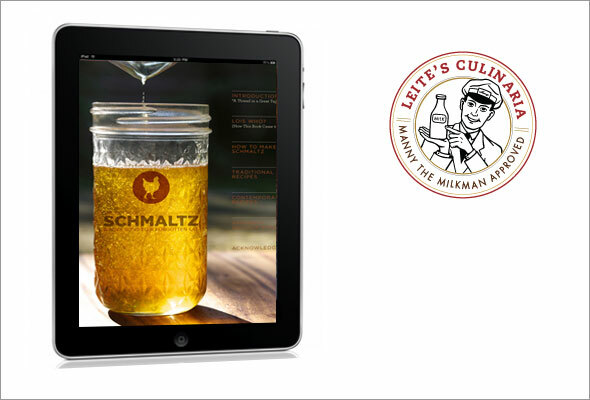 The Book of Schmaltz: A Love Song to a Forgotten Fat is available as an iPad download from iTunes for $7.99—and it’s worth every fat-slicked penny.